Our adventure, one horizon at a time. Fetch the Horizon is a chronicle of our journey to live the rest of our lives as a great adventure. We hope you will find the stories, anecdotes, journal entries, and thoughts posted here both fascinating and inspiring. Where this journey will go, or what this blog will end up being about, we’re really not sure. But we’d like to thank you for taking time to join us for a little bit of it. For more frequent but less substantial updates see or our facebook page. Fetch the Horizon by Paul & Jennifer Wheeler is licensed under a Creative Commons Attribution-Noncommercial-Share Alike 3.0 United States License. Many, or perhaps most, of the posts I’ve written here have been mere chronologies recounting our journeys in simple terms without flourish or expansion. My reasons for setting these events down has been some combination of a belief that our undertakings are worthy of sharing (narcissism? ), a desire to record the events of our lives for our own memory (diarism? ), and a hope that our stories will inspire people (delusions of grandeur?). To what end I hope to inspire people, I don’t know. Certainly not to be like me, since I’m sure if one weighs my virtues against my flaws the scale would tip steeply toward the flaws. I suppose my hope is that the knowledge of another person’s undertaking of any kind might broaden one’s view as to what paths lay open for them to choose. 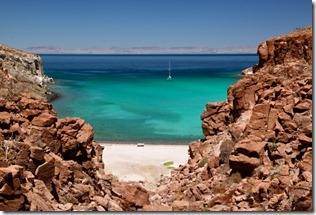 When it comes to our time in the Sea of Cortez, however, I’m at a loss for motivation to commit such a log to writing. In essence, our journey through the Sea, spent basking it tropical sun, diving in clear water among exotic fish, and sailing under deep blue skies, was idyllic. It was not without its trials and tribulations, including Jen’s brief and mysterious illness that caused us to make an emergency return to La Paz, rough conditions experienced beating up wind in a Norther1, losing our dinghy briefly due to a poorly tied knot (although I blame boat pixies), and others that I may recount at a later date. But the pleasanter aspects of our trip far outweighed the bad. We forgot our anxieties about the future. We succeeded in ignoring all the unfinished projects we’d promised ourselves we’d accomplish during all the free time on our trip, and even avoided most of the pangs of guilt our upbringing and culture have programmed us to have as a result of our lack of productivity. We delighted in time spent with visiting friends, and relished our new friendships made. We purely, deeply, and undistractedly enjoyed ourselves. But like all good things, our days in the sun had to come to an end. As I write this we are paying off the debt accumulated during our good times. That payment is in the form of a laborious and trouble laden bash north. Whence we will return to the real world of bills and bank accounts, professions and repairs. 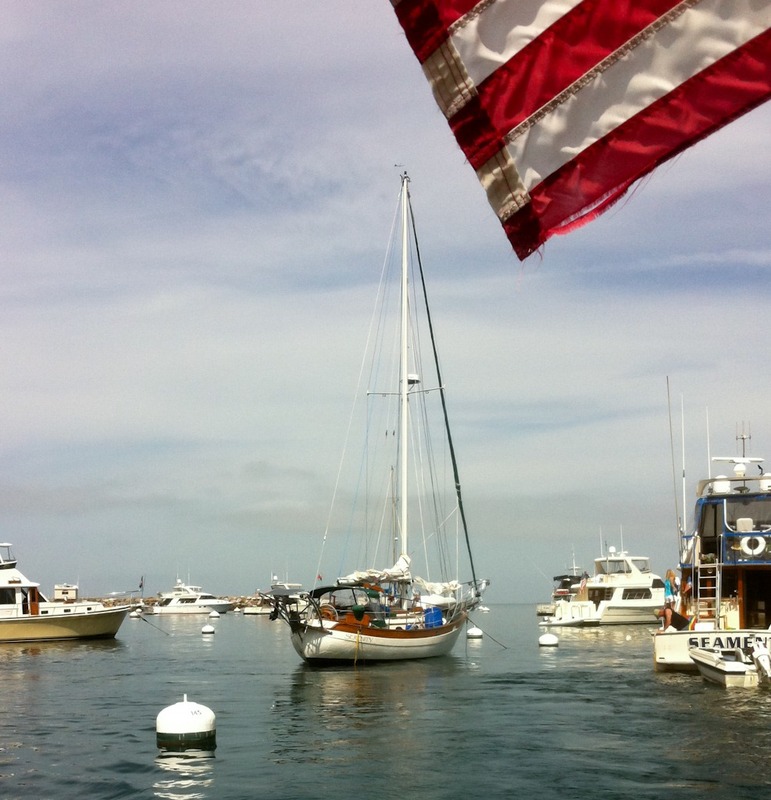 Our dreams of many years of cruising have largely been smothered by a soggy blanket of shortcomings in our boat and finances. But hopefully Serenity will shine anew with a year or two of love and we won’t become those people clinging to the deteriorating boat they once dreamed of going cruising in, only to put it off year after year to save a bit more or fix things up a bit more in all that free time or with all that extra cash we never seem to find, and when found is so easily lost again to a little temporary recreation. 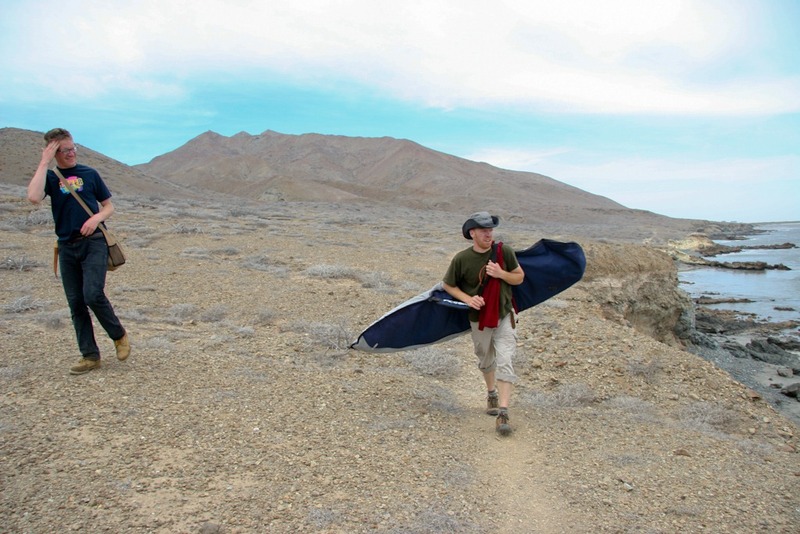 Norther: Strong north wind condition in the Sea of Cortez, caused by a high pressure region that develops over the deserts to the North and then funnels winds down the length of the Sea, reaching upwards of 30 knots and creating short, steep wind waves. The morning after we arrived in Bahia de Tortugas we slept in, enjoying our newfound freedom from the watch schedule. Shortly after we got up we were surprised to find that Mexican Navy making rounds through the anchorage. I was immediately glad I had done our entry paperwork in Ensenada, and felt somewhat vindicated in ignoring the suggestions that we check in at Cabo. Thankfully the visit from the navy was brief and painless. Later that day Bill and I went spear fishing and brought back a Garibaldi and an Opal Eye for dinner. Before the day was out we put the outboard on the dinghy and took a tour of the bay in the dinghy, on the way we stopped by Jatimo, the small sloop that had pulled into the bay earlier in the day. 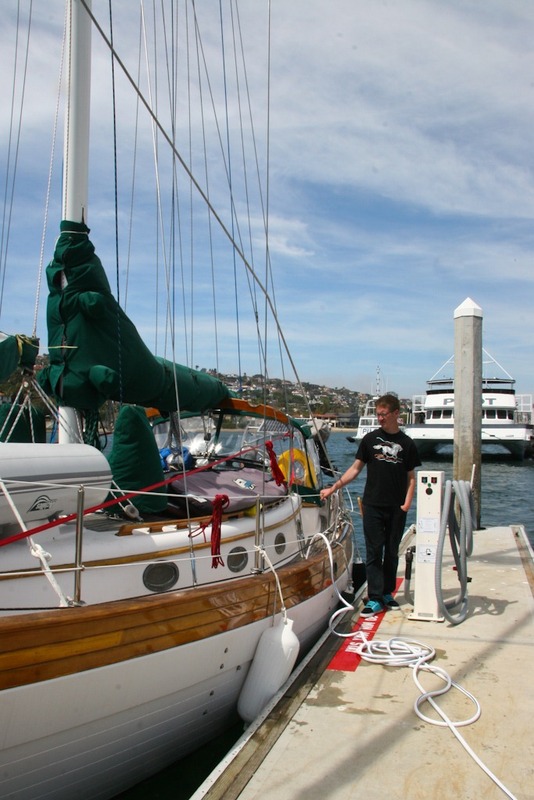 The vessel was sailed by Jan and Ramona, also from the San Francisco Area. I had been looking forward to actually meeting other cruisers and becoming a part of the community so I invited them over for dinner. The next day, my birthday, we went to town and were shown around by Pedro from the fuel dock. He awkwardly sat around while we ate our lunch, and after showing us the way to internet cafe, I realized why and gave him a few dollars to leave us in peace. Truthfully he was pretty helpful and it was nice that he didn’t outright demand money for his services. We grabbed some groceries and headed back to the boat. Jen made a delicious meal of risotto and squash, and Ramona brought over some homemade hummus and a salad of fresh veggies, always a treat when you’ve been at sea for a bit. We had a great time sharing stories of our travels. They had a lot more than we did, having been doing this for over 20 years, and it was a pleasure to listen them and gain some wisdom. Friday we returned to the village for lunch with a view at La Palapa. This quaint little cantina came highly recommended, and it lived up to the expectations. For those who might be visiting, just walk east along the beach from the pier, go up the small hill to the right just past where the fishing boats launch. It’s a small white open air building. Bring your Spanish-English dictionary as there are no menus. Afterward we went for a long walk out to Punta de Kelp. 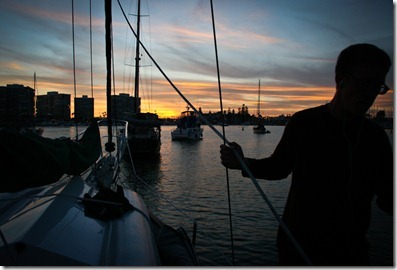 After four nights we left Tortugas in the afternoon for an overnight sail to Bahia Asuncion. The trip was another fast, double reefed sail down the coast, and we had to heave to overnight to delay our arrival until morning. For the last few miles the wind clocked around and we were forced to motor into a strong headwind and current, approaching the anchorage at a crawl. We spent a day and a half in Asuncion. After a long upwind row we did some more diving and fishing. 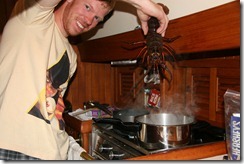 This time scoring a large Calico Bass on the rod (nice work Bill) and two lobsters. The lobsters are relatively easy to catch if you have a quick hand and a tight grip. Happily they have no claws with which to defend themselves. 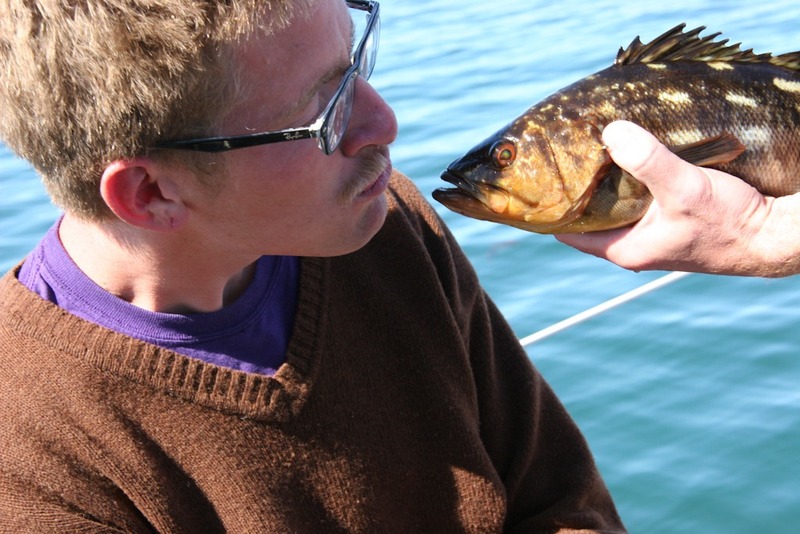 Unfortunately the kelp beds were so thick that stalking fish with the spear proved untenable. 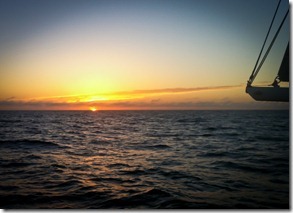 The following evening we departed for Bahia Santa Maria. The trip was again uneventful. 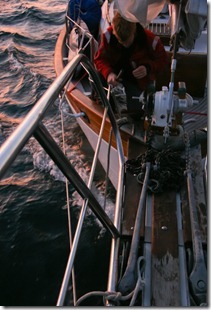 We sailed the whole way, only running the motor for the first few hours to charge the batteries. Our autopilot steered faithfully for the entire trip. We continue to have no luck trolling the hand line. 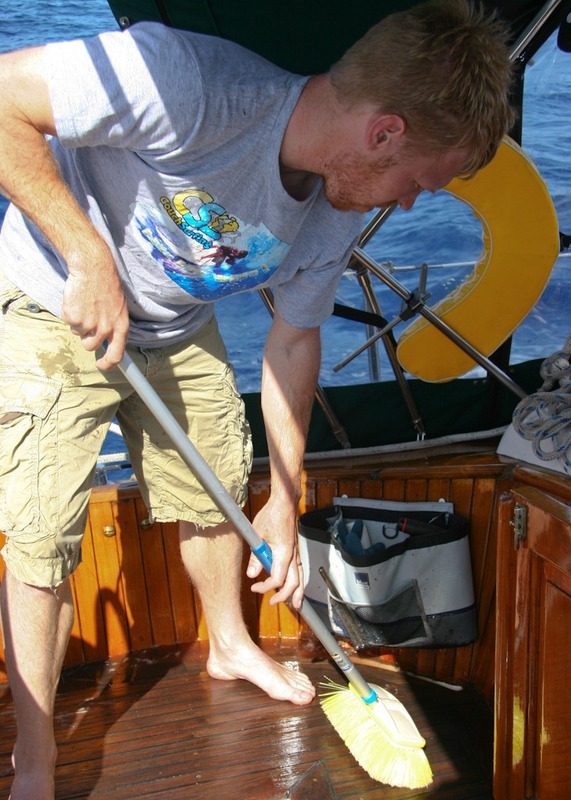 I taught Bill to put a reef in the mainsail. 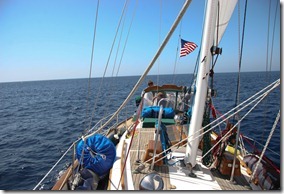 We sailed upwind into Bahia Santa Maria to within a half mile of the anchorage. 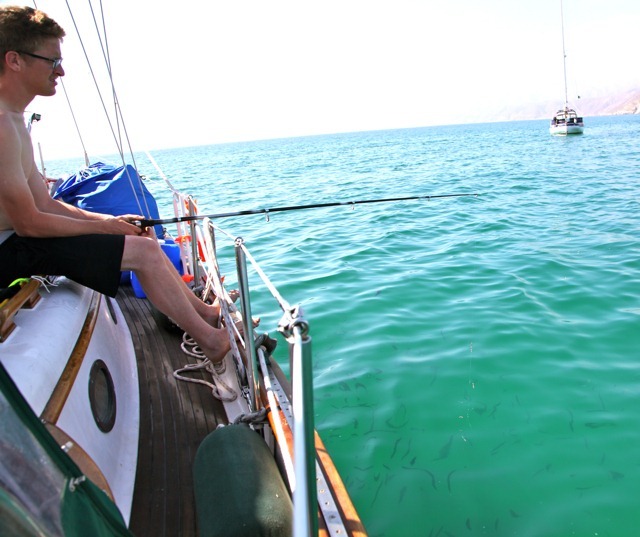 I wish I had some more poetical things to say about the trip, by suffice to say it was idyllic sailing. As soon as we had anchored in Bahia Santa Maria and had breakfast I was rallying the troops for a trip to shore to hike out to the point on the north side of the bay entrance. 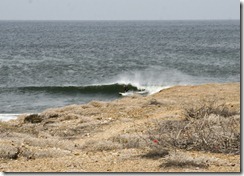 I had spied the telltale white spray of offshore winds on breaking waves and felt a burning desire to get some surf. To be honest my hopes were not all that high. We hadn’t been seeing much in the way of the south swell that would be required to make this spot break. Jen and Bill were both eager to get off the boat and hike around, so when breakfast was done we got the dinghy ready, packed up, and made the arduous paddle to shore in moderate winds. 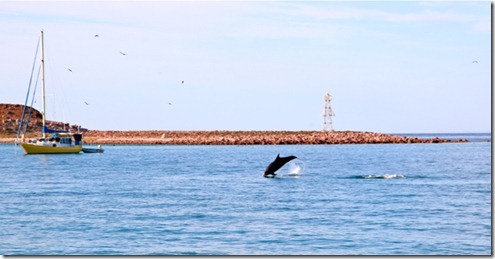 It was still nothing compared to the headwind Bill and I had fought to go fishing in Bahia Asuncion, where we only made it because I jumped overboard with fins to help propel us. Once on shore we discovered a convenient trail that took us the 1.5 miles out to the point. My excitement increased when I found evidence of a surf camp, which although it was vacant at the moment was clearly still seeing active duty during the peak season. Just then I started running. 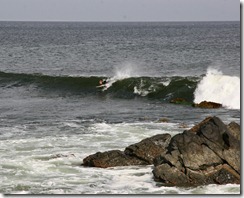 I was driven forward from within as I watched a set of waves wrap beautifully around a point into a small cove. 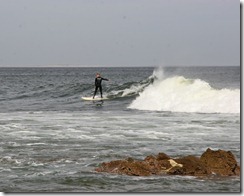 I couldn’t believe it, after months without surfing I was finally going to catch some waves. The session was great. 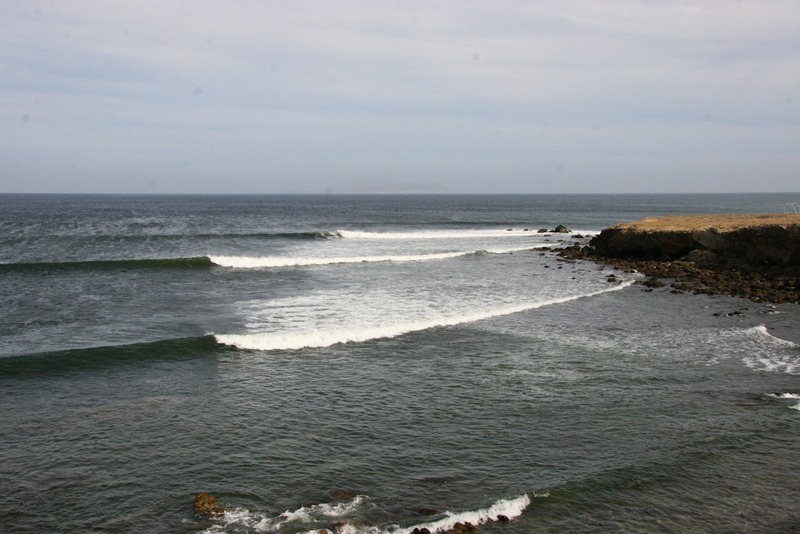 The sets were infrequent, but the waves were waist to chest high with smooth curling faces. The break had alternating steep and gentle sections, and the rides were long, making it a great wave to mess around on with cutbacks and sweeping turns. I couldn’t help but smile at the fact I had sailed over 1300 miles to ride these waves. The following day Bill and I took it easy on the boat while Jen explored the “village.” It ended up being completely abandoned, although not apparently disused. We theorized that it was used in peak season by the fishermen. Jen was then stranded on shore for two hours while she tried vainly to hail us on the radio. What she didn’t realize is that our portable’s transmit function had died. Wondering where she was I scanned the shore with the binoculars, but couldn’t see a thing for the light of the setting sun bouncing off the water. Finally the wind let up enough for us to here here faint shouts over its steady roar, and I pulled to shore to pick her up. Sorry Jen. Our last day at Santa Maria we made a second attempt at the surf. 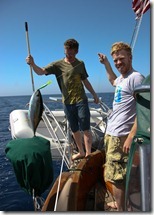 This time we were all armed with boards and we set out in the dinghy with the outboard. 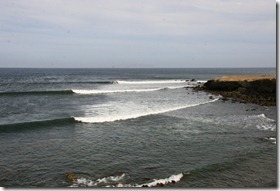 We zipped up the coast and put in at the panga landing beneath the surf camp. Unfortunately we made two critical errors. 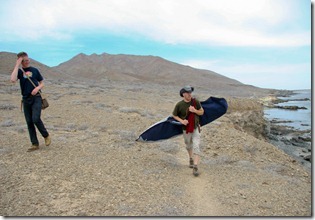 1) I hadn’t properly relayed the plan to bill so he had no shoes for the quarter mile walk we had to make to the spot. 2) The tide was much lower now, so getting out meant walking over 50 yards of barnacle encrusted rocks with urchins lurking in the cracks. Bill, who already had massive blisters on each foot from the walk to the spot decided it was hopeless and waited on the beach. Jen, struggling with a nine foot board which had a mind of its own in the strong offshore wind was having trouble making it past the fields of urchins. After paddling around in the break for a few minutes watching the others struggle I realized we need a new approach. 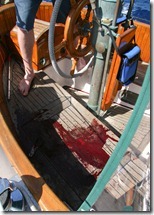 So with Bill wearing my too small sandals we headed back to the dinghy and simply motored out and dropped anchor. I felt like an idiot for not doing this in the first place with the swell so light. The break I had surfed two days earlier wasn’t showing at all, so we paddled around the corner to a totally hair-brained spot over shin deep boulders that jacked up steeply, and held up only for about 30 yards before smashing into the rocks on shore. After catching a few waves I shouted to Jen that you’d have to be crazy to try to surf this spot, as I paddled for another wave. It was a short but exciting ride in which you made a steep takeoff, doing everything you could to keep the nose from digging in and vaulting you bodily into the air, made a hard right and flew threw the hollow section over the shallow boulders, and then rode it out for a few seconds before bailing off to avoid the rocks. Fun! Back at the boat that evening we spent a few hours getting everything ready to go and then we were off to San Jose del Cabo. Ironically, after spending the last two days complaining about the constant, strong NNW wind that kept us rocking in the anchorage and fretting about our ground tackle (which held beautifully), the minute we got outside the cove the wind suddenly died. We had played it close with our schedule and had to been in Cabo in 48 hours to pick up my friend Steve there. So on went the motor and we proceeded in light and variable winds toward San Jose. But the gods of the sea and the wind smiled on us for a bit because after lunch the wind picked up. 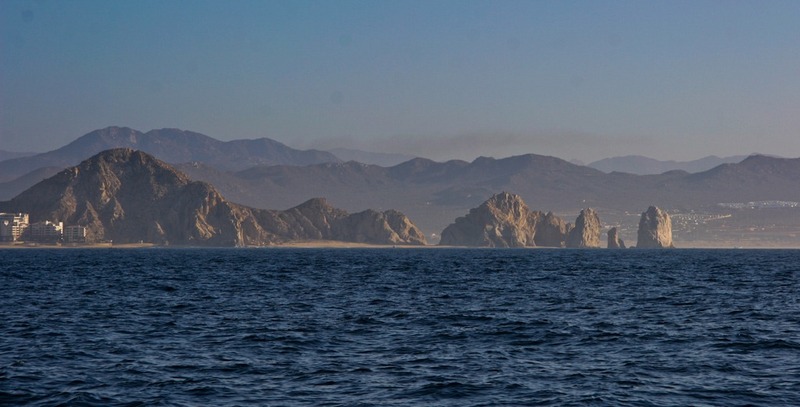 Having hoisted the staysail we were able to make 5+ knots close on the wind with Serenity steering herself dead on our best course for the Cabo Falso, the point at the south western tip of Baja. The sea was calm the wind was perfect and the weather warm. And just when it seemed things couldn’t get better we were surrounded by a massive pod of dolphins porpoising and breaching on all sides. They must have been feeding because moments later we got a strike on the hand line we’d been trolling on and off since San Diego with no luck. I watched as the line swung from side to side as the fish tried to fight. “Fish on” I shouted excitedly as I started hauling the line in. I’d been waiting to say that since I’d gotten the fishing gear in the first place. 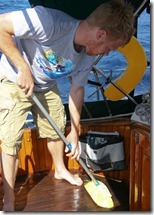 Bill came on deck to assist and deftly gaffed the fish and brought it on deck. 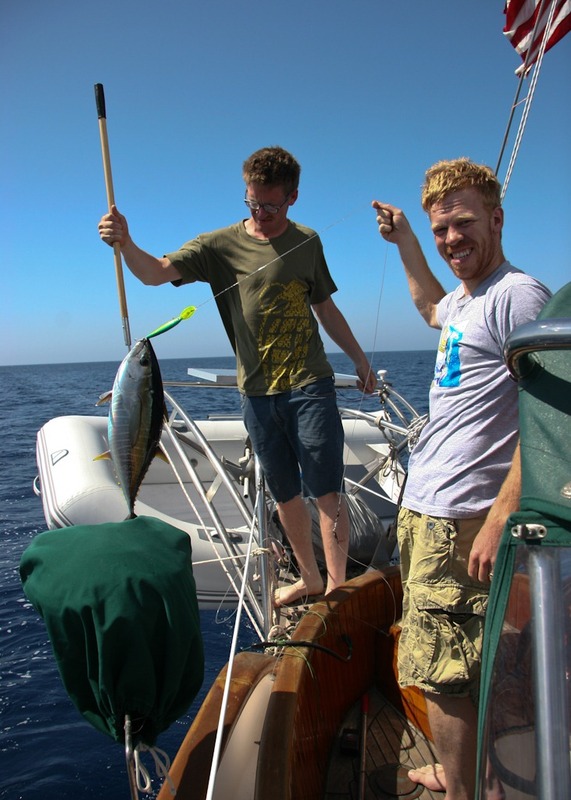 It was a small but beautiful yellow fin tuna (I say small, but that’s because they get up to 400lbs, this one would feed us for several days). Blood poured all over the place as we tried various techniques to disable the fish (alcohol on the gills, bashing with the winch handle, and finally decapitation). Once it was finally subdued I quickly fell to filleting, knowing that the tuna’s meat would be degraded by the post mortem nervous system activity and I wanted to get some good sashimi out of it. 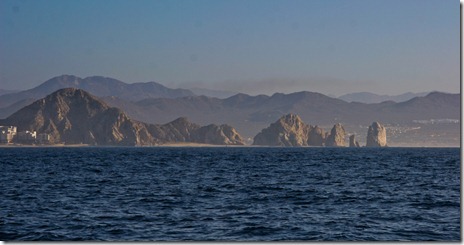 The wind failed at dusk, so after a dinner of tuna steaks and curry we motored on to San Jose del Cabo. 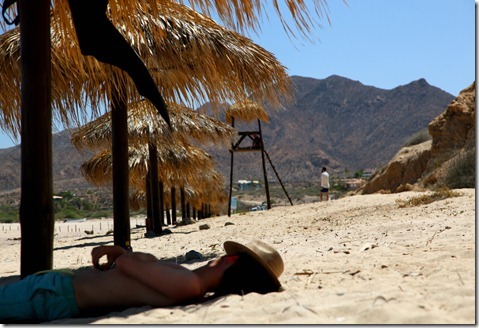 We decided to stay at the Puerto Los Cabos rather than deal with the glitz and hubbub of Cabo San Lucas. The marina is nice enough, and a slip sans electricity was only $44 USD per night (50ft slip), but the place is a sort of half finished feel, with a lot of incompletely construction and vacant trash filled lots right next to manicured lawns. After checking in at the marina office we were off to the nearest American restaurant to get what had become for us the yardstick of civilization: cheeseburgers. Conveniently, the cheap slips are on the side of the marina where Tommy’s Barefoot Cantina is located. They have great food, including American fare, cold beer, a pool table, and free wifi. We had officially made it to Los Cabos. For those who may be interested, there are multiple spots along this patch of coast. 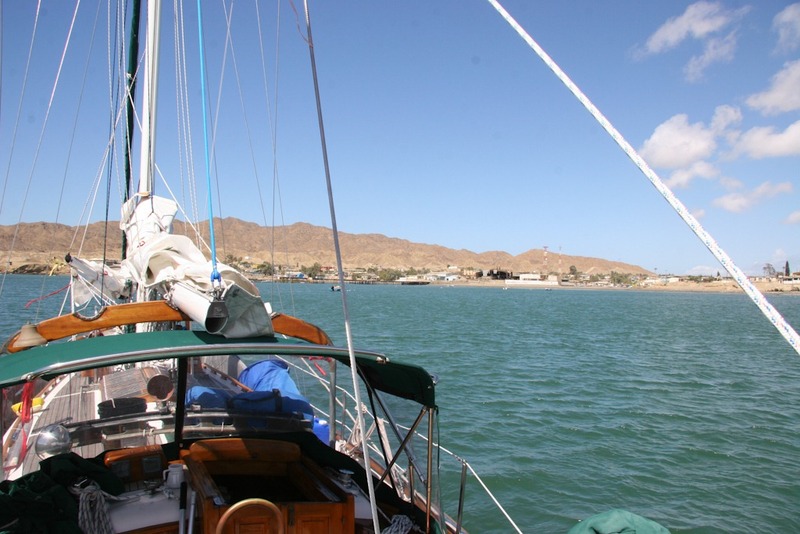 Bahia Santa Maria is a large deepwater bay with ample space for boats. It is just WNW of Bahia Magdalena (Mag Bay). Check the cruising guides for more details on Bahia Santa Maria, but I will say this: there is nothing here. No diesel, no water, no mercado, and nobody selling fish. So come well supplied. 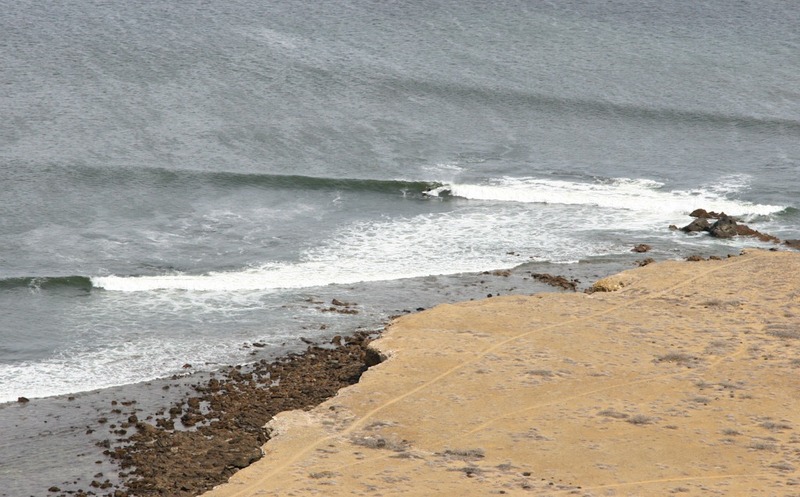 The surf we saw is located on the inside of the northwest point that makes the entrance to Bahia Santa Maria (aka Santa Maria Cove). 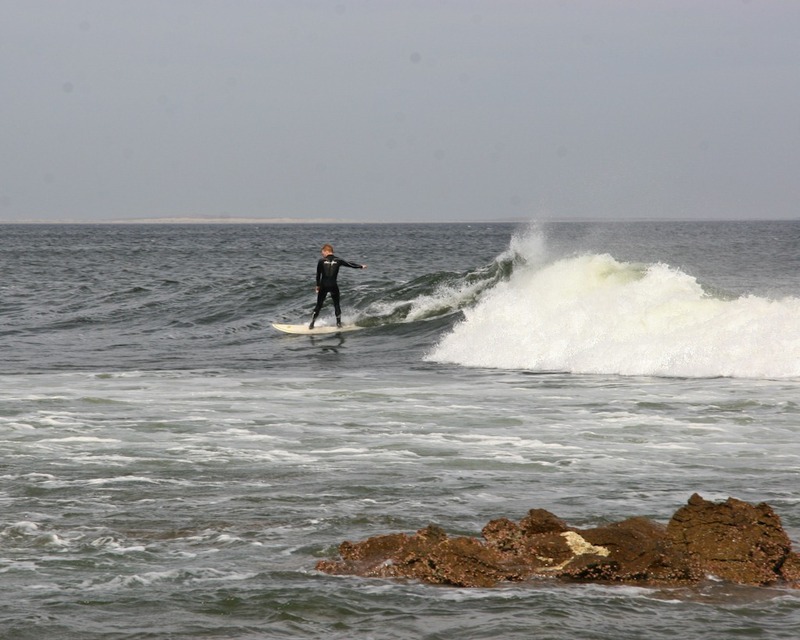 These spots all require a decent south swell, and high tide seems best. There were consistent off shore winds the whole time we were there (April 13-15 2011). I recommend a short board or fish, but you could make a longboard work. 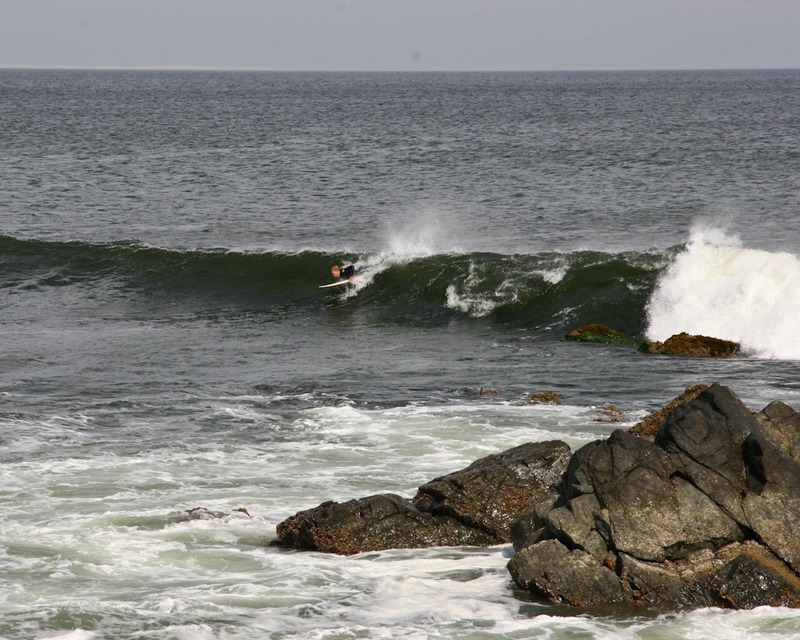 This isn’t a good beginner spot because if you don’t stay out on the shoulder you end up on the rocks and a small day means no day at all, not to mention you need to dodge the occasional rock in the lineup. Urchins and barnacles are an issue, so bring boots. There is a small protected landing spot just beneath the surf camp where the fishermen tie up. There are also trails further out the point and north toward the fishing camp/village where there are more landing spots. 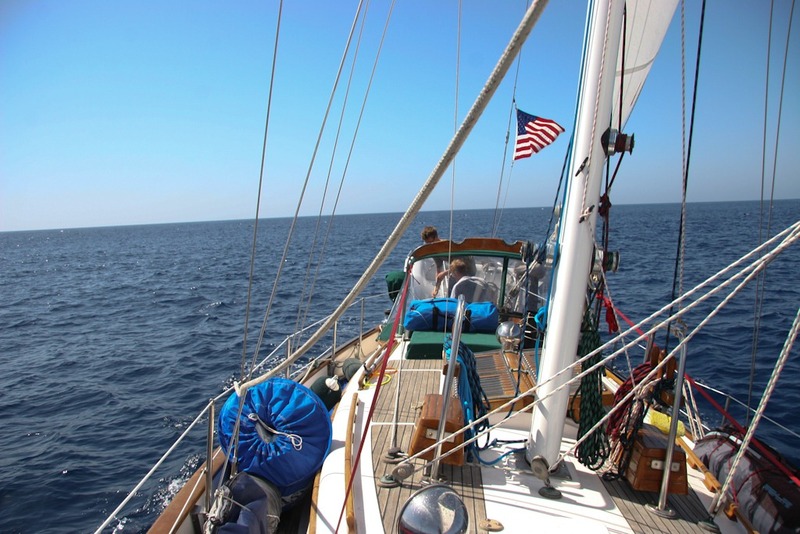 We were anchored at 24°46.276N 112°15.488W, 300 yards off the coast about three quarters of a mile south of the inlet to Santa Maria Lagoon. We went ashore on a patch of sand right where we were anchored. 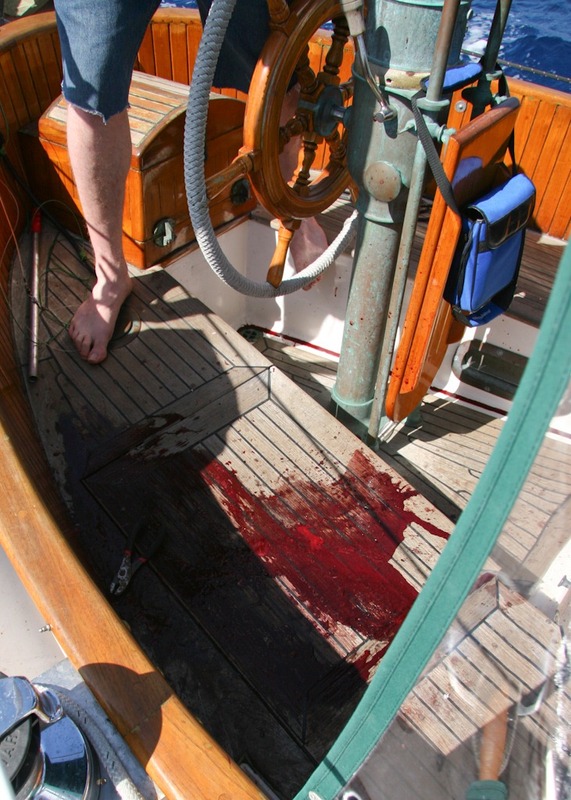 In any case, be careful where you leave your dinghy because of the tide. The hike out wasn’t too bad, but motoring out definitely saves time and arm strength. The second time out we just dropped the dinghy anchor just outside the break in 15 feet of water because the swell was small. We interrupt the tale of last fall’s trip to the Channel Islands to bring your news of our current whereabouts and happenings. 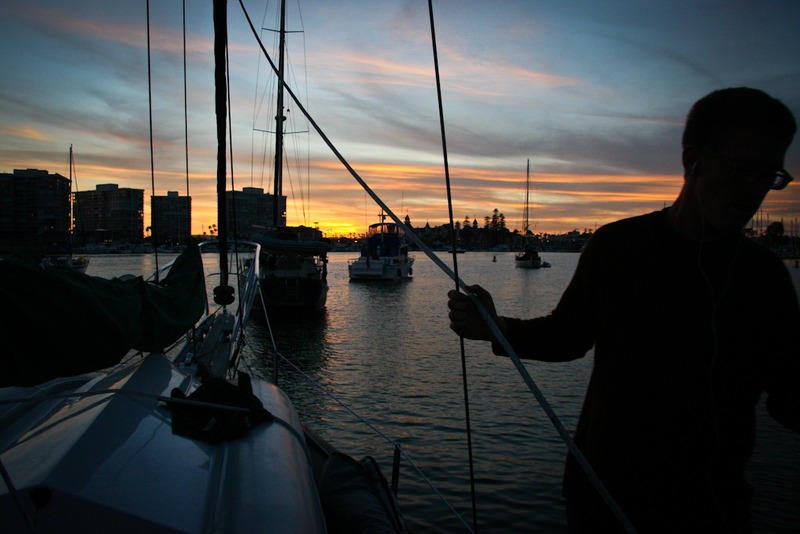 The short version is: we’ve been in San Diego for two weeks, and now we’re headed to Baja! 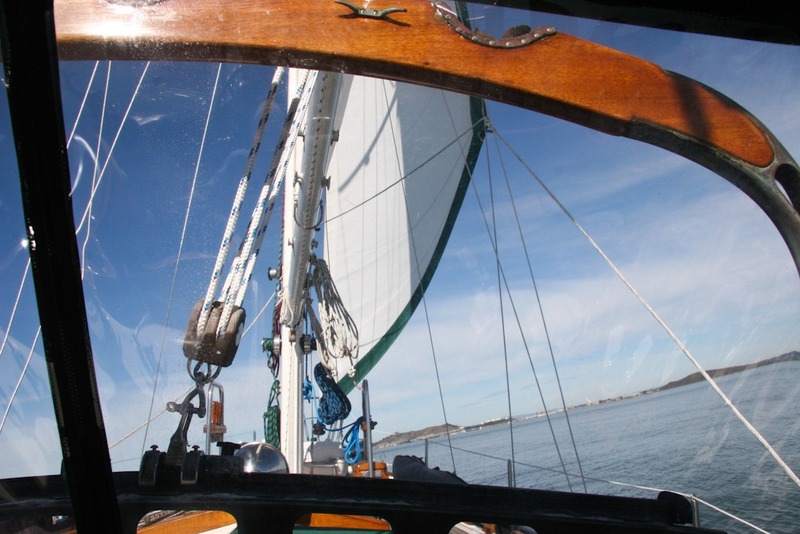 On Tuesday the 8th of March we departed our slip at the Berkeley Marina, and headed south. Bound for the southern tip of the Baja Peninsula and the Sea of Cortez, our first stop was to be San Diego. The trip down was mostly an uneventful mix of sailing and motoring. That is until we got to Point Conception. We left when we did to avoid one of several large storm systems that had been and continued to be attacking the California coast. 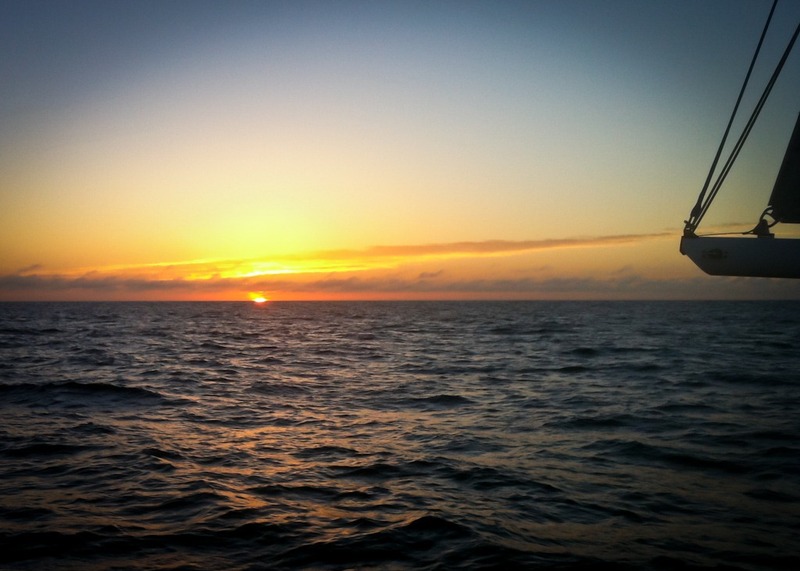 We knew we had to reach our destination by the weekend to avoid heavy weather, and we new there was no avoiding the typically rough conditions around Point Conception. Even approaching the point from well off shore things began to pickup pretty quick. By the time I had put the first reef in, I immediately decided to add a second, and I’m glad I did. It blew 30-40 knots, with waves to match, all night and didn’t let up. In fact, some time in the early morning our autopilot managed to tear itself off it’s mount trying to fight a wave that was rounding the boat up. As a result we had to hand steer the boat from that point on. We continued to have heavy conditions around the point and past the northern Channel Islands, where things moderated a bit. About half way from Santa Cruz Island to Catalina the winds finally died off to almost nothing, and we decided to fire up the engine, and get in to Avalon sooner rather than later for some much needed sleep. 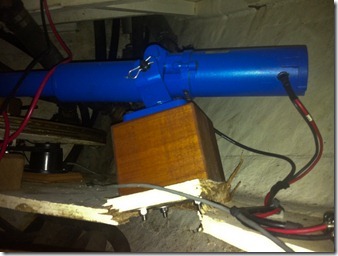 Unfortunately I had failed to keep a careful eye on our batteries, and the engine wouldn’t start. It was well after dark so we decided to heave to, keep a watch, and deal with it in the morning. Lucky for us I had gotten all the supplies I needed to wire up our new solar panel. Well almost all of them. So, with wires strewn around the nav station and cockpit, I was able to get enough juice to start the engine. After monitoring things more carefully for the next 48 hours I decided the battery bank itself was partially to blame and would need to be replaced in San Diego. 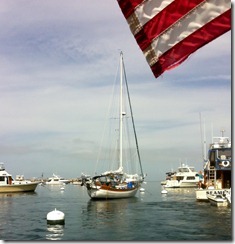 We moored at Avalon harbor for two days. We slept, showered, shopped, and reassured all our friends and family that we were safe from the tsunami that had threatened the California coast while we were off shore. 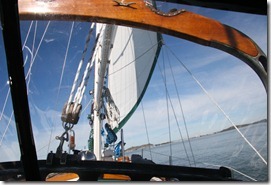 It felt good to return to Avalon in our own boat, having visited last fall in Fetchin’ Ketch. We had made our first passage, albeit a short one, on our own. An accomplishment for any burgeoning cruiser. On Monday the 14th we departed Avalon for San Diego. Before we left however, we made a stop at one of the nearby anchorages where I tried in vain to get the autopilot functioning again. It turns out the hydraulic piston that turns the rudder had not only been dismounted, it had fried some internal component. After a frustrating few hours spent on the autopilot I decided to jump in the water and do some snorkeling. 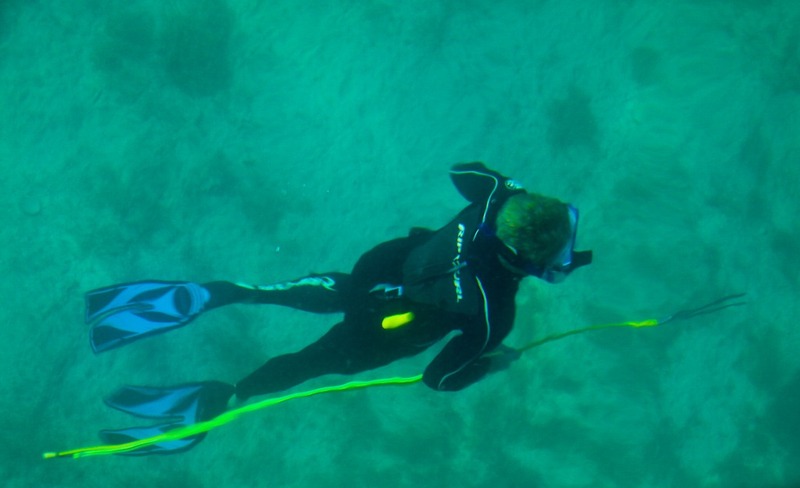 I donned my gear, my video camera, and jump in. The water wasn’t too unpleasant considering the temp was in the low 50s. I took a look at our anchor, watched a ray take off from it’s hiding spot in a cloud of silt, and headed for the kelp beds near shore. After just a few minutes kicking around with the garibaldi and perch, I rounded a stalk of kelp right into a seemingly massive 5 foot shark. Needless to say that brought a swift end to my snorkeling endeavors. In retrospect I wish I had stuck around to try to get a little footage. The shark probably would have been just as scared of me, and been eager to go find some smaller prey. Around dusk we started up the motor and made our way over to San Diego. We had timed our departure to make a morning arrival in San Diego in order to give us time to figure out arrangements for docking/mooring/anchoring. I knew San Diego had a public guest dock, but at a cheap $10 a night I was worried it would be full up. But as it turns out the dock isn’t really that crowded when it’s not the season for cruisers to be passing through, and we’re going south pretty late. Now for the last two weeks we’ve been in San Diego fixing/installing/procuring stuff. I rewired the solar panel properly, replaced our battery bank and wiring, added a battery monitor so we wouldn’t have any more engine starting issues, and installed a new alternator with a fancy charge regulator. 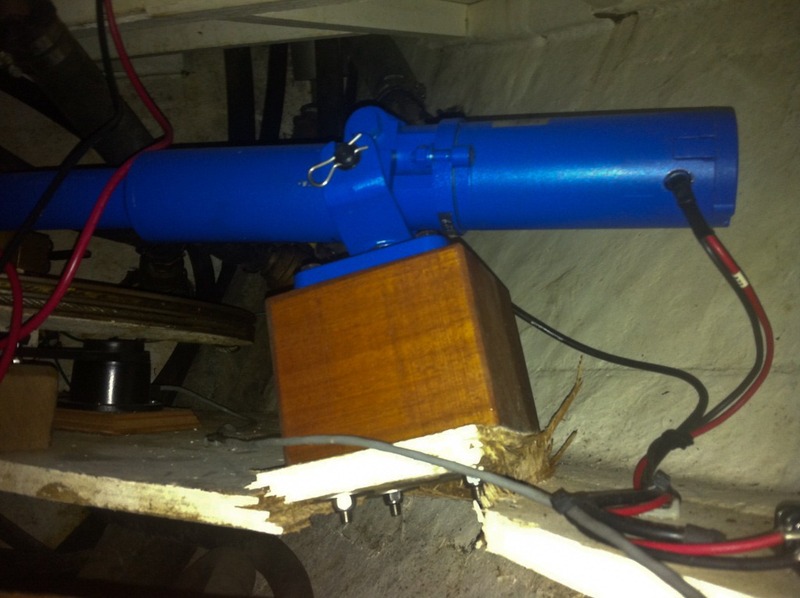 We had professionals take care of the autopilot and VHF antenna wiring issue (turns out somebody botched the installation of the connector at the top of the mast). Right after I post this we will be weighing anchor and heading south. 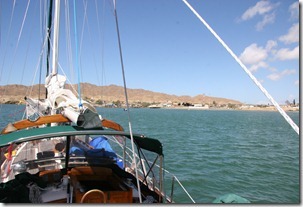 Our first stop will be in Ensenada to do our entry paperwork. Many people have told us to just go south and enter at Cabo, but the official story is that if you’re entering with a pet you have to have a health certificate that is less than 10 days old. 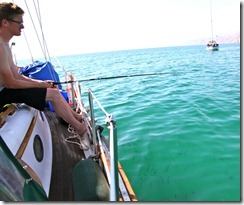 Plus I’ll feel a lot more comfortable going a shore at the anchorages along the way with all our paperwork in order. 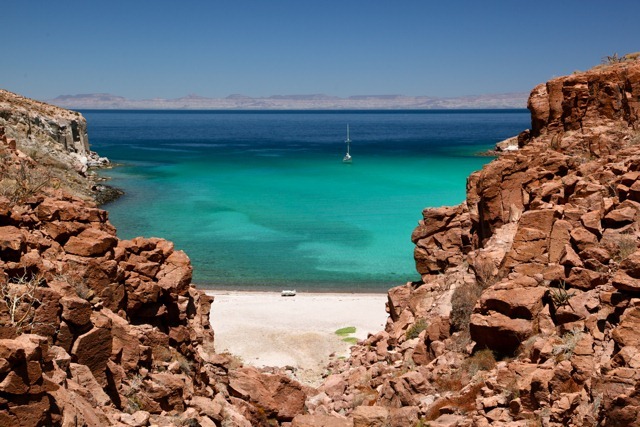 From there we’ll be off shore a few days before anchoring at Bahia de Tortugas for a bit, followed by Bahia Santa Maria. We’ll be back in touch from Cabo San Lucas on or around April 16th. Until then you can watch our progress on our SPOT tracker page. Things I did on Bali: ate at a secret organic restaurant, swam in hot springs-fed pools at a secluded spa, photographed a misty volcanic lake, rode ojek (motorbike) on windy mountain roads in the pouring rain, fell in a rice paddy, and bribed a police officer. And that was just one day. 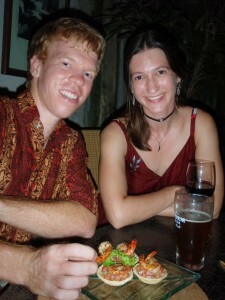 At the end of our stay in Indonesia, we managed to fit in six short but busy days on the island of Bali. Even just the name of the island conjures up a hectic barrage of images and expectations: a sublime tropical isle, relaxing on beautiful sunny beaches, world class surf, fancy resorts, and swinging bars and clubs. And from our own experiences so far in Indonesia, we expected cheap local food, limited western cuisine, touristy shopping areas, and the same hot, muggy weather. Additionally, there was an unknown factor – we were overlapping our stay to hang out with Mel, a friend of my stepmom, who was traveling with several friends we had never met before. The combination of the novel and the expected that we found was just right. The resort in Seminyak was wonderfully luxurious, especially after weeks in homestays and other relatively humble accommodations. There was plenty of shopping to be done, with great finds everywhere, such as the beautiful batik, handmade by locals in the traditional style. Sometimes it a took a little effort to find, but there was good local food all around, with the usual cheap prices. 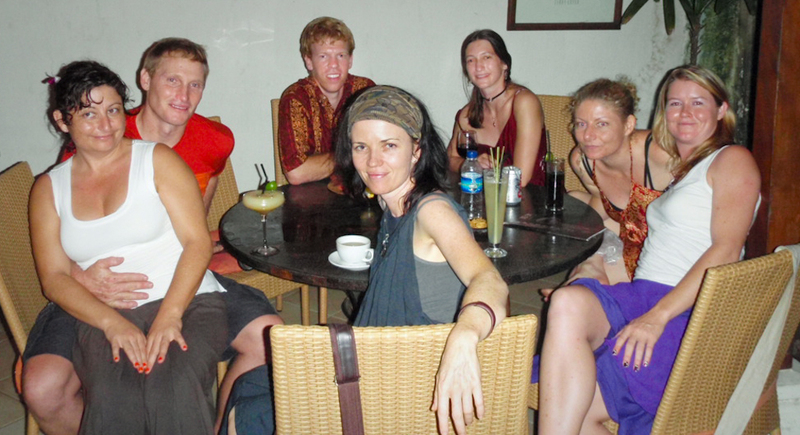 And the music scene in Ubud was first rate, with a variety of genres played live every night by seriously talented bands in multiple cool bars. Some of the best parts were completely unexpected. There was more western food at the resort’s expansive breakfast than we had seen in the past two months combined, including many things we had been sorely craving. Mel’s clan of Aussies were the best by far, from her partner, Jason, and her sister, Sue, to her friends Toni and Simone. They were up for anything, with plenty of fun plans and ideas, but also willing to be spontaneous and able to keep smiling no matter what craziness got thrown at us. We enjoyed finding good food together, chatted for hours, and danced the nights away as if we had been at it for years. Of course, there were some not so pleasant surprises as well. The beaches were not much cleaner than others we had seen on Java, and the waves weren’t very impressive either, although we didn’t look very hard for the real surf spots. The expected hot muggy weather was broken up by rain, often ending an afternoon out. We didn’t let that dampen our spirits too much, but the hassling from locals selling things was downright aggravating. The Kuta shopping area and adjacent beach were the worst – in many areas you could barely go ten steps without being set upon by hawkers shoving cheap sunglasses or sarongs in your face. Many shop workers tried to harass you into buying something, often lying to your face and inventing ridiculous stories to go along with their outrageous prices. Yet despite having a few of the worst experiences, our time on Bali included some of my all time favorite memories of the whole trip. 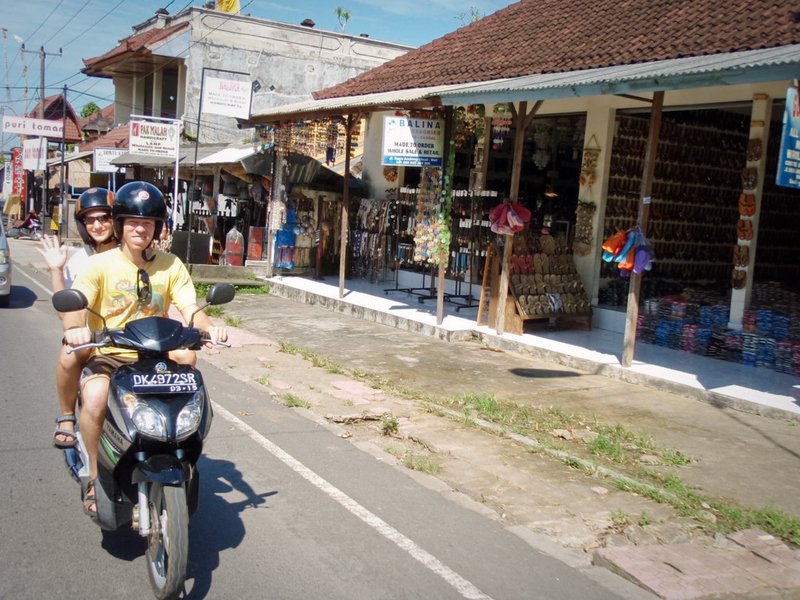 One of the top experiences was our trip on ojek out of Ubud to the volcanic crater lake. The sun was warm overhead but the breeze was refreshingly cool. We cruised slowly along the straight, flat, smooth road past craft shops and terraced rice paddies, with increasingly more impressive views of old volcanic cones, raising their green tops amid a perfect blue sky. The leisurely pace set by our friendly and helpful tour guide allowed us all to enjoy the scenery and for Mel to take plenty of photos. 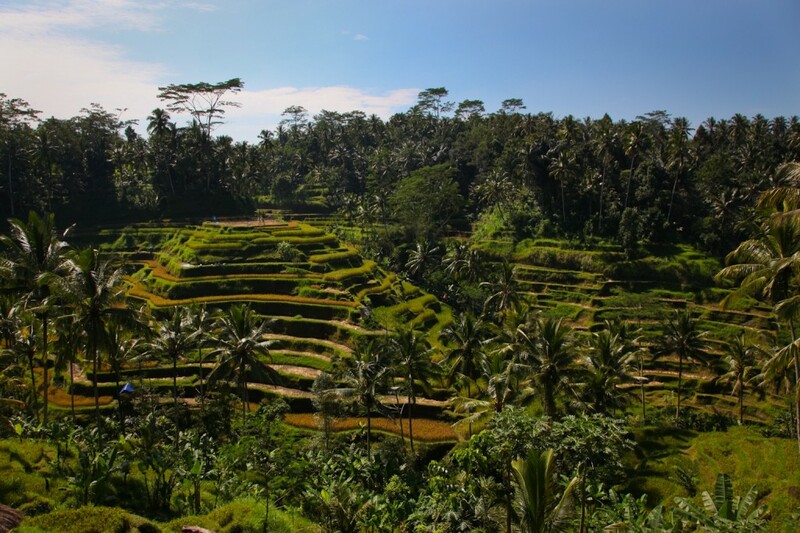 It was the right kind of adventure, just like our time in Bali – a wonderful blend of the expected and unexpected. To put it simply, I was Happy.